A Florida man pushed his 82-year-old grandmother to the ground Saturday night after he was denied a “debit card he needed to buy cake,” police allege. 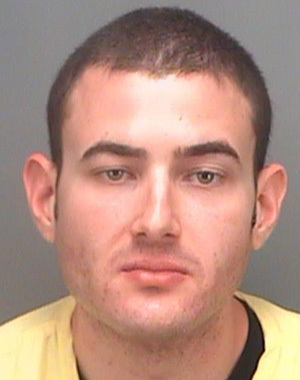 Adam Tanzer, 26, was arrested for battering the elderly victim during a dispute inside a residence in Palm Harbor, a community about 25 miles west of Tampa. According to cops, Tanzer pushed Barbara Bliss to the ground “in an aggressive way,” causing her to fall on her hands and hip. The report does not indicate what injuries were suffered by Bliss, who required medical treatment. Tanzer, pictured above, was charged with battery on a person 65 or older, a felony. He was released from jail yesterday afternoon, and has been ordered to have no contact with his grandmother.